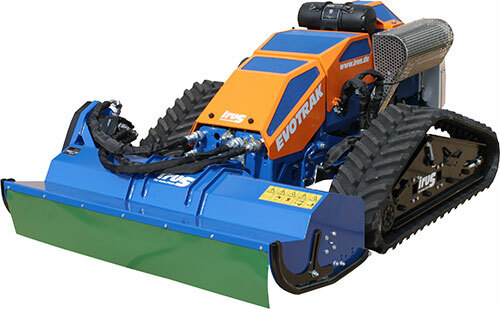 The Irus Evotrak is probably the most capable steep bank mower. It boast’s excellent balance with a very low Centre of Gravity and wide Track footprint. The machine is small and light enough to be carried in small Van rather than the need to tow a trailer. The Irus Evotrak is probably the most capable steep bank mower. Due to its lightweight Construction and powerful Aero spec 30hp petrol Engine. It boast’s excellent balance with a very low Centre of Gravity and wide Track footprint. The Engine and Hydraulic pump systems are carried on a swivel platform maintaining the Centre of Mass and ensuring adequate lubrication. The machine is small and light enough to be carried in small Van rather than the need to tow a trailer. Permanent hydraulic drive for both crawler running gears. proportional speed control for each track. Reversal of operation controls when machine is traveling toward you. We are be able to supply new machinery, attachments and spare parts. To make an enquiry please call us on 01460 242562 or email us using the link below.